Will Michigan Philanthropy’s Support of Economic Development Be Inclusive? The state’s big foundations invest in community development. This brings beneficial economic impacts but risks failing to be truly inclusive of Michigan’s diverse communities. What Was Rage Philanthropy After All?—And Has It Run Its Course? One survey shows a decline in contributions to progressive charities by liberal donors as the Trump Administration enters year two. But the actual story is a lot more complicated than that. Cash-strapped localities continue to challenge the tax-exempt status of property owned by nonprofits. The NewsMatch program shows that smaller, niche journalism sites have a shot at sustaining themselves with donations from the public and their readers. Local city councilmember finds himself juggling between two rival community-based nonprofits, leading him to violate the city charter. The fruits of its labor via rage fundraising in 2017 give the national civil liberties organization the firepower it needs to help lead the resistance to Trumpism in 2018. 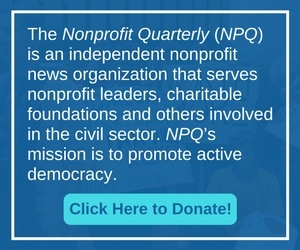 A nonprofit news site in San Diego illustrates the growth of locally focused nonprofit journalism outside of the New York-Washington sphere. American Jewish giving is linked to education, income, and a long tradition of valuing charity. A California consumer advocacy nonprofit that promotes transparency doesn’t always practice it. An effective advocacy effort, some believe, requires more than numbers; it needs some audacious creativity.